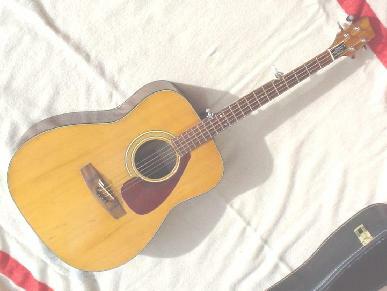 I converted this Yamaha FG200 in 1990. I replaced the back with solid mahogany (had a hole in it) and shaved the neck, plus changed the bridge and put on one that is compensated for octave tuning, strings about 28w through 52w. Top is 3 ply spruce, all quartered(!). Piezo pickup under the bridge, end pin jack. Shubb capo 5th with the rail set at a slant to the fingerboard & a notch in the fingerboard under the the string at the 13th fret to store the sliding finger under tension so it does not rattle. It is compensated for guitar strings and tuned one octave low. It likely would not be too far out with fairly heavy strings at normal banjo pitch/register (14/17/22(w? )/28w/14 as a guess), yet I give no guarantees. It uses ball end strings, pin bridge, i.e. just use guitar singles. I think it has 28w/34w/42w/52w/28w on it now......old too. This was a pretty easy project: new back, backstrip and I think a couple braces, shave the neck, move wood around on the headstock and put Honduras rosewood veneer on both sides to cover the grain change, pull the frets, shave, refret, shubb, strap button, radio shack piezo while the back was off. The mahogany was selected at the local lumber yard, sliced, surfaced, sanded, and joined. the binding is pulling away on the sides by the back between the upper and lower bout from shrinkage. If you have any thoughts about converting a guitar to 5 string, here is a ZIP file of 11 detailed pictures, 600KB.